A bust of Edward Ehlers, Honorary Grand Master of The Grand Lodge of Free and Accepted Masons of the State of New York, Civil War hero, and Grand Secretary of The Grand Lodge of Free and Accepted Masons of the State of New York for 36 years. This bust was carved by Gutzon Borglum, the sculptor of Mount Rushmore. It has long been in my mind that a real, vital portrait bust of you ought to be in existence, and I have turned it over in my mind a great many times, as to how this could be brought about. I have been loth (sic) to suggest it to anyone able to bring it about or able to pay for it, but I feel more and more strongly that it ought to be done, and I have so said to three or four of my friends. It occurred to me today, and as is my habit I am acting upon it, that the only way to do it is to begin it. I shall be very closely confined to work in my studio for the next month, making a large Lincoln, - which it would interest you to see, - and as I work rapidly it has occurred to me that perhaps you would be willing to come to the studio a couple of times a week for an hour, between four and five, after your day's work is done, and sit for me, and let me make a bust of you. I should immensely enjoy doing it, and then it would be done and in existence. About May first, possibly a week earlier, I shall go to a country home that I am building, and my time in New York will be broken and less regular for many months to come. The bust should be finished before I go. When it is done I should like to present it to my Lodge, with instructions to them to present it to the Grand Lodge at the close of my administration. What do you think of this? Are you willing to be victimized to this extent? Are you willing to let me have the pleasure of making what would be a very much prized by your great body of friends? If you are willing to take the obligation say I, pronounce your name in full, lock it up in your bosom and say nothing to anyone, not even a worthy brother of your degree, no matter how well he is tried, - and let me know on Wednesday. This will cost me very little trouble, and the bust will be greatly prized by all of us. I am going to my country place tomorrow and so will have my secretary type this in the morning and sign it for me. Gutzon Borglum, per Charles Barnett, Secty. Edward Ehlers was born in Denmark and moved to New York with his family in 1844. He served during the Civil War for three months in 1861 in the Twelfth New York Militia. He reenlisted the same day as his discharge into the 52nd New York Volunteers, and was promoted to First Lieutenant on January 10, 1862, and to Captain on January 16, 1863. He was wounded and was transferred to the Veteran Reserve Corps on December 10, 1863. On March 13, 1865, he was brevetted a Colonel of Volunteers, 'For gallant and meritorious services at the battles of Fair Oaks, Gaines' Mills, Peach Orchard, Savage Station, White Oak Bridge, Malvern Hill, Second Bull Run, South Mountain, Antietam and Fredericksburg.' On January 1, 1865, he was honorably discharged. Shortly thereafter he began his lengthy and illustrious Masonic career. In Triune Chapter of the Royal Arch Masons, he served as King for two years and as High Priest for two years. In Cryptic Masonry he served as Deputy Master; 1881; and was Thrice Illustrious Master; 1883; in Adelphic Council No. 7, Royal and Select Masters. In Chivalric Masonry he served as Captain General; 1874; 1875; 1876; as Generalissimo; 1877; 1878; as Eminent Commander; 1879; 1880; and as Grand Inspector of the Grand Commandery of New York; 1881; 1882. In the Ancient and Accepted Scottish Rite, Northern Jurisdiction, he served as Deputy Master of the Lodge of Perfection; Orator of the Council of Princes and as Master of the Rose Croix Chapter for seven years. He served as First Lieutenant Commander for six years, and on September 20, 1881, he was crowned a Sovereign Grand Inspector General of the 33rd degree. He was one of the original members of Mecca Temple, Ancient Arabic Order of the Nobles of the Mystric Shrine. In the Knights Templar, he was an Honorary Member of the Drill Corps of Monroe Commandery, in Rochester, N.Y., and of Damascus Commandery No. 5, in Newark, N.J. He was an Honorary Member of the Masonic Veteran's Association of Brooklyn; the Masonic Veteran's Association of Newburgh, N. Y., and is a member of the Masonic Veterans' Association of New York City. He was a Companion of the Military Order of the Loyal Legion of the United States, Commandery of New York, as well as a Past Commander of George G. Mead Post, No. 38, G. A. R. and was a member of La Fayette Post, No. 140, G.A. R., N.Y.C. He was also a member of the Old Guard Association of the 12th Regiment, N.Y.S.M. When the body of President Lincoln was carried through New York City to be forwarded to Springfield, Illinois, Brother Ehlers was in command of a battalion of the Veteran Reserve Corps, and took part in the obsequies. Because of his great skill in organizing and maneuvering large bodies of men, he was instrumental as Adjutant General during the centennial anniversary parade on November 25, 1883, of the British evacuation of New York City, as well as for the celebration of the centennial of the inauguration of George Washington as President in 1888. He also served as an Aide on the staff of General Hancock at the obsequies of General Ulysses S Grant in 1865. He was present as Master of Continental Lodge during the cornerstone laying of the Masonic Hall in N.Y.C. in 1870, and served as Marshal of the day during the laying of the cornerstone of the Egyptian Obelisk in Central Park in 1881; at the laying of the cornerstone of the Masonic Home in Utica, N.Y. in 1891 and at the ceremony of the Home's dedication in 1892. As Grand Secretary, he assisted at the laying of the many cornerstones of public and Masonic buildings, and was deputized by the Grand Master to act in his stead at the cornerstone laying ceremonies of the High School in Lockport, N.Y., 1890; of the Masonic Temple at Poughkeepsie, 1894; of the Public School in Mount Kisco, 1894 and of the Masonic Temple of Island City Lodge No. 586, 1906. He dedicated the monument erected by New York State to commemorate General Nicholas Herkimer at Daube, N.Y., 1896, and dedicated the Pantheon erected on Staten Island in memory of Garibaldi, 1907. He served as Trustee of Schools in the 9th Ward, N.Y.C. and was an Honorary Member of the Masonic Historical Society of New York, as well as being a member of the Society of the Army of the Potomac. His reputation as a skilled and inspiring orator was well-known throughout the state, to Masons and non-masons alike. Edward Ehlers was born in Denmark and moved to New York with his family in 1844. He served during the Civil War for three months in 1861 in the Twelfth New York Militia. He reenlisted the same day as his discharge into the 52nd New York Volunteers, and was promoted to First Lieutenant on January 10, 1862, and to Captain on January 16, 1863. He was wounded and was transferred to the Veteran Reserve Corps on December 10, 1863. On March 13, 1865, he was brevetted a Colonel of Volunteers, 'For gallant and meritorious services at the battles of Fair Oaks, Gaines' Mills, Peach Orchard, Savage Station, White Oak Bridge, Malvern Hill, Second Bull Run, South Mountain, Antietam and Fredericksburg.' On January 1, 1865, he was honorably discharged. <br>Shortly thereafter he began his lengthy and illustrious Masonic career. In Triune Chapter of the Royal Arch Masons, he served as King for two years and as High Priest for two years. In Cryptic Masonry he served as Deputy Master; 1881; and was Thrice Illustrious Master; 1883; in Adelphic Council No. 7, Royal and Select Masters. In Chivalric Masonry he served as Captain General; 1874; 1875; 1876; as Generalissimo; 1877; 1878; as Eminent Commander; 1879; 1880; and as Grand Inspector of the Grand Commandery of New York; 1881; 1882. <br> In the Ancient and Accepted Scottish Rite, Northern Jurisdiction, he served as Deputy Master of the Lodge of Perfection; Orator of the Council of Princes and as Master of the Rose Croix Chapter for seven years. He served as First Lieutenant Commander for six years, and on September 20, 1881, he was crowned a Sovereign Grand Inspector General of the 33rd degree. <br> He was one of the original members of Mecca Temple, Ancient Arabic Order of the Nobles of the Mystric Shrine. In the Knights Templar, he was an Honorary Member of the Drill Corps of Monroe Commandery, in Rochester, N.Y., and of Damascus Commandery No. 5, in Newark, N.J. He was an Honorary Member of the Masonic Veteran's Association of Brooklyn; the Masonic Veteran's Association of Newburgh, N. Y., and is a member of the Masonic Veterans' Association of New York City. <br> He was a Companion of the Military Order of the Loyal Legion of the United States, Commandery of New York, as well as a Past Commander of George G. Mead Post, No. 38, G. A. R. and was a member of La Fayette Post, No. 140, G.A. R., N.Y.C. He was also a member of the Old Guard Association of the 12th Regiment, N.Y.S.M. <br> When the body of President Lincoln was carried through New York City to be forwarded to Springfield, Illinois, Brother Ehlers was in command of a battalion of the Veteran Reserve Corps, and took part in the obsequies. Because of his great skill in organizing and maneuvering large bodies of men, he was instrumental as Adjutant General during the centennial anniversary parade on November 25, 1883, of the British evacuation of New York City, as well as for the celebration of the centennial of the inauguration of George Washington as President in 1888. <br> He also served as an Aide on the staff of General Hancock at the obsequies of General Ulysses S Grant in 1865. <br> He was present as Master of Continental Lodge during the cornerstone laying of the Masonic Hall in N.Y.C. in 1870, and served as Marshal of the day during the laying of the cornerstone of the Egyptian Obelisk in Central Park in 1881; at the laying of the cornerstone of the Masonic Home in Utica, N.Y. in 1891 and at the ceremony of the Home's dedication in 1892. As Grand Secretary, he assisted at the laying of the many cornerstones of public and Masonic buildings, and was deputized by the Grand Master to act in his stead at the cornerstone laying ceremonies of the High School in Lockport, N.Y., 1890; of the Masonic Temple at Poughkeepsie, 1894; of the Public School in Mount Kisco, 1894 and of the Masonic Temple of Island City Lodge No. 586, 1906. He dedicated the monument erected by New York State to commemorate General Nicholas Herkimer at Daube, N.Y., 1896, and dedicated the Pantheon erected on Staten Island in memory of Garibaldi, 1907. <br>He served as Trustee of Schools in the 9th Ward, N.Y.C. and was an Honorary Member of the Masonic Historical Society of New York, as well as being a member of the Society of the Army of the Potomac. <br> His reputation as a skilled and inspiring orator was well-known throughout the state, to Masons and non-masons alike. 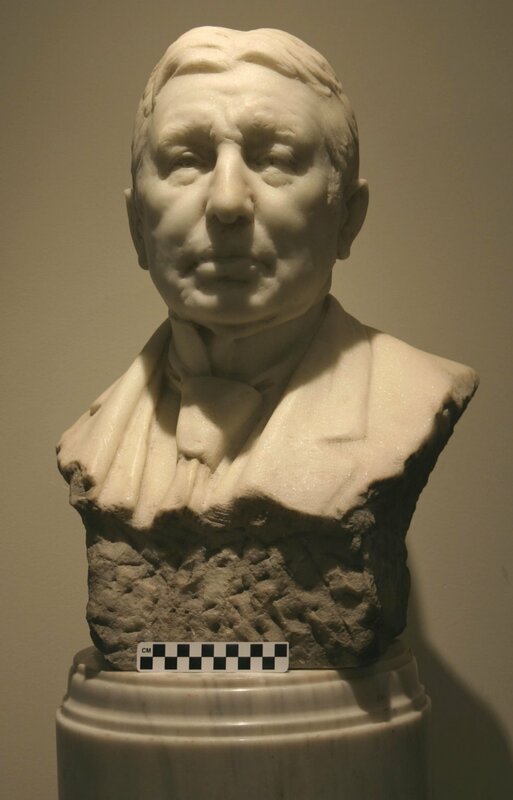 Life-sized bust with the head and upper suit delineated and with the base of rough, un-carved marble. The artist has signed his name into the marble on the back.